Family-owned and operated, ADMAR Construction Equipment and Supplies is the largest independently owned construction equipment and supplies company in New York and Pennsylvania. ADMAR has been operating in central New York for more than 20 years and offers superior customer service and on-time deliveries of aerial work platforms, rough-terrain forklifts, excavators, compressors, pumps, generators, concrete solutions and compaction, along with an extensive service and parts department. ADMAR is an exclusive regional dealer for Kubota Construction Equipment, Stihl, Gehl, Topcon, Honda Power and Wacker Neuson. Auctions International is an online auction company specializing in the sale of government surplus assets. Its online auctions generate 25 to 40 percent higher returns than traditional disposal methods. Municipal sellers pay no commission. Blair Supply is a top full-line stocking water/wastewater distributor representing major manufacturers in the industry. The company has been in business since 1958 and has stocking warehouses in Rochester, Watertown and Avoca. As part of Bosch Rexroth Canada, the Compu-Spread business unit exclusively focuses on developing the industry's most advanced electronic and hydraulic spreader control units. Ford, Chevrolet/GMC and RAM Fleet and Commercial vehicles with government contract pricing. Cen-Pe-Co heavy-duty lubricants, chassis lubes, gear lubes, and money-saving fuel additives. Certified Cirus Control Systems designs, engineers, manufactures and distributes hydraulic components and systems, electronic controls, plow controls and innovative winter road maintenance data collection and reporting software to help maximize fleet performance year-round. Clinton Tractor & Imp Co. will be displaying the Ventrac all-wheel drive compact tractor. With more than 30 commercial grade attachments that connect in just minutes, the Ventrac can be used for all seasons. From sidewalk snow management, brush mowing, slope mowing, leaf removal, aeration, and much more, the Ventrac can be your one-tractor solution. The company will be displaying a wide variety of trailers. The company distributes Contech Engineered Solutions Steel and Aluminum Pipe Products; Kennametal carbide plow blades; Franklin traffic paint; municipal cast iron casting; signs and signposts; square, round and U-channel; sign hardware and finished signs and safety equipment; Turner poly riser rings; and Ladtech manhole adjustment rings. Permanent pothole repair/instant road repair; SCJ Spray cold joint sealer provides permanent and instant solutions for road repairs in any weather at any time. Feathering control valves, swivel pedestals and armrest control packages. The DewEze Reel Transport bed combines an integrated reel lift into a durable flatbed, creating a versatile unit for standard loads and fifth wheel towing. This unique design is the heavy lifter for reels and spools, making it the most cost-effective bed on the market. DICKEY-john offers a range of products for easy use and powerful performance to keep drivers' focus on the road. From high-tech, user-friendly ice control systems to advanced road and temperature sensors that give you detailed real-time data, the company can help its customers take command of the road. Dig Safely New York Inc. is the one-call center serving as a link between you and the underground utility operators. Established in 1969, Dig Safely New York promotes an easier, safer digging environment and serves the entire state of New York outside of Long Island and New York City, which is covered by New York City One-Call. Headquartered in East Syracuse, Dig Safely New York's customer service representatives (CSRs) are based in East Syracuse and Latham; call centers are available 24/7/365 to assist with information on planned excavations. CSRs then distribute the information from these calls to six facility owners/operators, on average. Contractors, design engineers and home/property owners can place a location request by calling toll free at 811 or 800/962-7962, or by using online location request programs: i-notice and Single Address Ticket. DSI Recycling Inc. & Clean Burn DSI/Clean Burn is a leading distributor of used oil heating appliances that include used oil furnaces, used oil boilers and used oil recycling centers that generate free heat from motor oils and petroleum-based fluids, which are commonly used in all types of internal combustion engines. Clean Burn used oil heater equipment is exclusively engineered from the ground up to burn used oils and also burn standard fuel oil for added versatility. Call 800/824-4115 or visit www.dsirecycling.com. Eastcom Associates Inc. has been a distributor of utility products since its inception in 1972. The company currently stocks a complete line of products dedicated to utility location, leak detection, fault location and pipeline inspection. Eastcom Associates services customers in the Northeast and Mid-Atlantic regions and provides onsite product demonstrations, applications training and technical support. Its service center located in the company's home office in New Jersey provides customers fast and effective repair service. Call 908/722-7774. Ennis-Flint offers a comprehensive product lineup to meet pavement marking/traffic safety needs for the government, contractor, airport, streetscape, commercial and global markets. Products include traffic paint, thermoplastic, pre-formed thermoplastic, plural components, colorized surface treatments, markers, detectable warnings, decorative crosswalks and retroreflectometers. EZ STREET is a polymer-modified high-performance industry-changing cold asphalt guaranteed to permanently repair potholes, utility cuts, overlays and edge repairs in asphalt or concrete. Available in bulk and bags, EZ STREET cold asphalt works in water and all weather conditions. It's easy to apply, requiring no mixing or tack coat. EZ-Liner manufactures the most complete line of paint marking equipment on the market. EZ-Liner has been setting the standard for quality pavement markings since the 1960s. EZ-Liner builds some of the most dependable, innovative and hardworking striping equipment available. Whether customers are in the market for a walk-behind striper or a large long line highway striper, EZ-Liner offers quality equipment to fit their needs. Fire Service Safety Testing Inc.
Stop by Fire Service Safety Testing Inc.'s booth for a demonstration of Liquitube Permanent Premium Tire Sealant. The product works on trucks, machinery, mowers or anything with an inflatable tire. TARCO V-Box spreaders, TARCO all-season dump bodies, TARCO leaf loaders and BOSS snowplows and Poly V-Box spreaders. 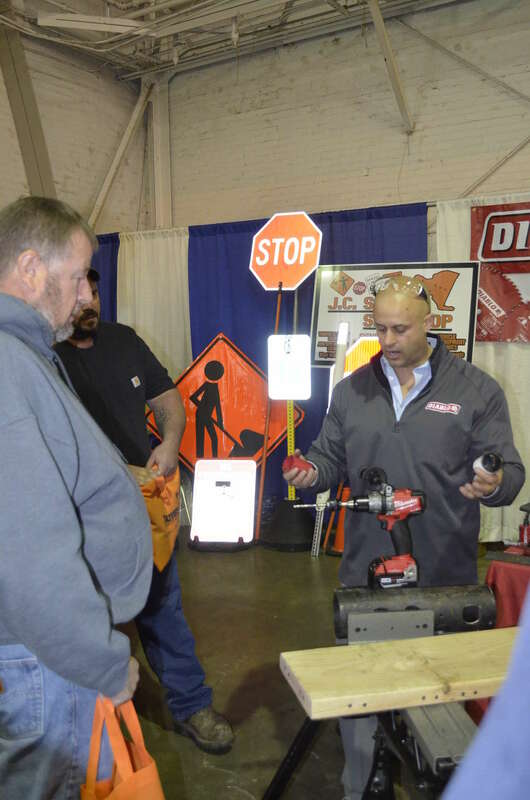 While Glenco Supply Inc. will be displaying many different types of municipal supplies, its focus during the Expo will be its in-house sign shop, solar-powered rectangular rapid flashing beacon (RRFB) and many other innovative items. Chevrolet pick-ups, chassis cabs with body up-fits, and the new Chevrolet 4500HD and 5500HD chassis cabs. The company offers heavy equipment repair. The company offers snow and ice control products. Peterbilt sales and service and all make parts sales. The company offers fabric/steel buildings. Innovative's ProMelt line of premium liquid de-icers offer an attractive price-to-performance ratio with superior magnesium chloride and calcium chloride products that deliver effective solutions for all winter road maintenance needs — ProMelt Magnesium, ProMelt Cal, Magic-0 by ProMelt, and ProMelt Ultra. Ironhawk is a distributor of snow removal and road maintenance wear parts to State Departments of Transportation and other governmental entities. Its product mix includes snowplow blades, blade protectors, plow shoes, snowplow hardware, plow marker kits and spinners. J & J Equipment is a leading supplier of municipal and industrial equipment. Its product lines include Tymco street sweepers, Loadmaster refuse trucks, Falcon asphalt equipment, Superior road brooms and Aries sewer equipment. The JAMAR RAC Geo II is the industry standard for distance measuring instruments. This cost-effective unit saves time and money by allowing personnel to measure distance — accurate up to 1 foot per mile, while driving as quickly or slowly, as necessary. Results can be read directly off the DMI's display. Much safer than the old “Hand-Wheel,” these units will pay for themselves in increased productivity in a matter of days. When combined with the RACPro software, this system provides a comprehensive sign and inventory solution. The JAMAR Radar Recorder accurately records up to two lanes of bi-directional traffic data without personnel ever having to go into the road. Simply mount the unit at a convenient location, aim it at the road and you'll begin collecting highly accurate data in a matter of minutes. The company offers highway safety products and signage, power tools, light equipment and much more. Hot and cold water pressure washers from Landa; undercarriage cleaners; salt eliminator detergents; and Val6 infrared heaters. Consumable MRO products — hydraulics, DOT brake fittings, fasteners, cutting tools, abrasives, shop supplies, spray aerosols, lubricants, degreasers, electrical and automotive supplies. McQuade & Bannigan Inc. (MQB) is family-owned and operated and has been in business since 1907. MQB provides construction and industrial tools and supplies, including air compressors and tools; concrete tools and chemicals; construction equipment; cutting tools; fasteners; generators; hand and power tools; maintenance supplies; material handling; pumps; safety equipment; scaffolding and ladders; and woodworking machinery. MDI Truck is a complete maintenance repair facility that strives for total customer satisfaction. Its team is committed to providing customers with prompt, professional and quality service. The company's experts can maintain and repair vehicles, as well as supply the parts and equipment needed to keep fleets operating. MDI provide plows and spreaders to prep trucks for the winter season and can custom fabricate whatever customers need. Pavement preservation services; FiberMat; crack fill; NovaChip; UltraWear full-depth reclamation; and surface treatments. Milton CAT is the Northeast dealer for Caterpillar machinery and power systems, as well as for a range of top name brands that complement the Caterpillar product offering – Metso screening plants, Genie aerial lifts, and Sullair compressors. Milton CAT serves light to heavy construction, forestry, agriculture, governmental, paving, scrap, demolition, and waste, as well as marine, prime and stand-by power generation industries. Through rentmachines.com, a network of independent rental stores, Milton CAT offers short-term rentals. Visit www.miltoncat.com. • The Case 621G wheel loader is designed to provide best-in-class visibility; ground-line serviceability; and excellent balance and stability for roading, hauling, loading and other applications. On NYS OGS/NJPA Contract. Comes with PROCARE: three-year/3,000-hour full factory warranty; SiteWatch and Telematics and three-year planned maintenance (paid for). • Trombia Sweeper: This attachment can turn a wheel loader into a year-round area and city sweeping unit and carry out the same jobs as self-propelled vacuum sweepers, but with more efficiency and with only marginal investment costs. • Hamm HD14i VV double drum roller: an articulated tandem roller with two vibratory drums. Easy transport, simple loading, ergonomic driver platform, excellent view of the drum edges and the machine and the construction site surroundings. 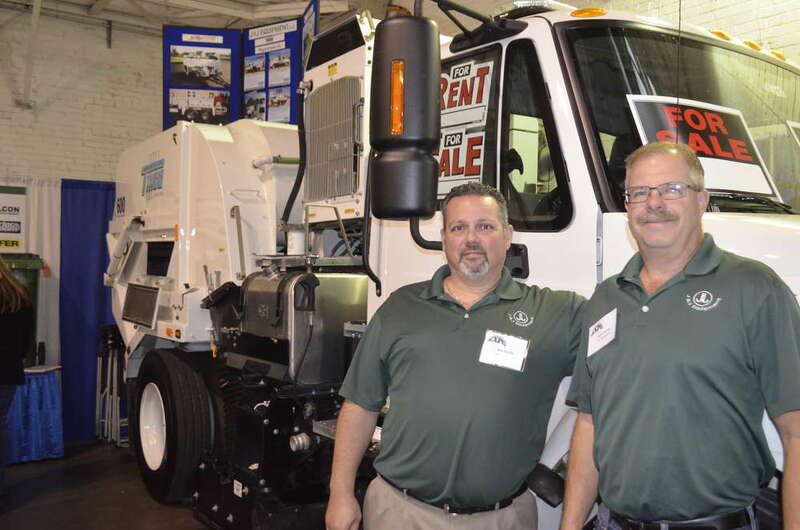 Monroe Snow and Ice Control, a division of Monroe Truck Equipment Inc., is one of the largest manufacturers with a complete line of snow and ice removal equipment. Montage Enterprises has specialized in fine quality flail mower parts for more than 35 years. The company is now manufacturing its own Kut-Mor brand flail mower. Montage also sells sand and salt spreader parts. NYS Association of Town Superintendents of Highways (NYSAOTSOH) — With more than 1,100 members, it is the largest transportation association in New York State. Its board members are active in representing its members' needs before various state agencies and association partners, such as OGS and the Cornell Local Roads Program. NYSAOTSOH's legislative efforts consistently make a difference in pursuing a larger share of transportation funding and reviewing any legislation concerning local highways. NYSAOTSOH is prepared to support its members in local matters that may threaten “home rule” or best practices in highway maintenance. Onspot Automatic Tire Chains are permanently mounted to the vehicles' rear suspension and allows the operator to engage and disengage tire chains at the flip of the dashboard switch without stopping to enhance traction and reduce braking distance on snow and ice in forward or reverse. Onspots are available as a factory option from more than 200 OEMs or for retrofit of existing vehicles from half-ton to Class 8 tractor trailers. Manufacturer of the Helac PowerTilt tilting coupler for excavators and backhoes. Tilt your bucket or attachment up to 180 degrees and increase productivity by 50 percent. Position your bucket … not your machine. The PETROMAT family product offering of pavement interlayers. Asphalt crack filler, pothole repair, cold patch. Roll Rite is a leading manufacturer of electric tarp systems, tarps, gear motor technology and automated power solutions. Roll Rite LLC designs and manufactures state-of-the-art automated tarp systems and components for the heavy-duty trucking industry and serves the municipal, construction, waste, scrap and recycling industries. Live with Internet and monthly Internet auctions from one of the most highly respected and successful auction teams in New York State. The company has 45 years of experience in municipal and construction equipment sales. Additional services include equipment appraisals and replacement programs. RustKote is a petroleum-based two-step “drip-less” process that provides the best protection from corrosion on any vehicle. The company's two products provide lubrication, draw out moisture, protect electrical and neutralizes the effects of salt and road-brine. RustKote's proprietary polymer allows it to creep, repel moisture and cling to metal for a cleaner application. RustKote is an annual application, designed to penetrate any existing rust and get down to the base metal to prevent the rust from spreading uncontrollably. RustKote offers mobile truck service fleets with trained technicians. For a quote or more information, call 716/308-0829 or e-mail Dan Pfohl at Dan@RustKote.com. SealMaster is among the world's largest manufacturers of pavement sealer and sealcoat with pavement sealer, sealcoat and pavement maintenance product and equipment. The company's innovative pavement sealer formulations and state-of-the-art pavement sealer manufacturing technologies have enabled SealMaster to become the world's number-one producer of pavement sealer and sealcoat. How people and goods are transported is drastically changing. Commercial ADAS and autonomous vehicles are now equipped with cameras, LiDAR, sensors and other hardware systems that enable the vehicle to perceive its environment correctly —and act on those perceptions — to keep drivers and passengers safe. Yet, these hardware systems can't perceive their environment if they can't see. And they can't see when it snows, when freezing rain coats the hardware, when mud kicks up, or when bugs smash onto these surfaces. This is why SEEVA Technologies is building a family of products that clean any surface of a vehicle, whether it's a windshield covered in thick ice or a sensor caked with mud. This year, SEEVA will be exhibiting its SEEVAthermHD and SEEVAthermAV systems, which use heated washer fluid to flash-clean surfaces and increase vehicle uptime. Heated washer fluid is the simple and proven solution for cleaning hardware perception systems because it lowers the surface tension of ice, dirt and bugs while providing higher solubility than cold fluids. Hot washer fluid enables a vehicle to use just 25 percent of what cold fluids use to clean surfaces, and clean each surface in a fraction of the time. Custom dimensional signs for municipalities. Entrance signs to towns and villages, park signs, directional signs, court house, libraries, golf courses, school/college signs and development signage. The company serves all of western and central New York State, including the Finger Lakes region since 1986. Call 585/237-2620 or visit www.signlanguageinc.com. SnapTite is a well-known pipe product used across New York State for culvert rehabilitation. Counties, highway maintenance, municipalities are all users of the company's product and all appreciate the fact that they can self-install these solutions. Culvert repair is made easy and the product is available on the OGS contract. Sound Off Signal is a manufacturer of LED lighting and warning systems. Amber Warning Solutions Visit https://www.soundoffsignal.com. Municipal trucks for all applications. Stephenson Equipment Inc. specializes in serving the paving, road repair and maintenance markets in New York State and Pennsylvania. Stephenson offers sales rentals, parts and service for all of the equipment lines it represents, including LeeBoy pavers, Rosco sweepers, Bomag mills and rollers, Cedar Rapids pavers, Diamond mowers and more. Axles, beacon/strobe lights, bed liners, dump bodies, dry vans, lighting, fire extinguishers, flat bed trailers, hoist, spreaders, ladder racks, landscape bodies, pick-up caps, utility trailers, Reading truck bodies, Bri-Mar Trailer, Meyer Snow Plow, Smith Metals sanders. SWS Warning Lights customers feedback has allowed the company to create a culture of innovation that's focused on providing product solutions and customer satisfaction. Its products withstand the harshest environments while using the latest technology — all while being designed and built in North America. Industries such as public works, utilities, agriculture, mining, road construction, waste management, heavy equipment demand the best in the warning light market and SWS Warning Lights Inc. has been chosen to provide these needs since 1969. Tenco Industries is a leader in snow and ice control products for airports and highways. Tenco is an Alamo-owned company that provides installation, parts and service in a facility that provides customers with a modern facility that is rapid and efficient. Tenco Industries invites Expo attendees to visit, Ken Brink, Shane Chapman, Glenn Plaisted and Pete Matzke at its booth. Leaf vacuum equipment; leaf vacuum parts; street sweeper parts; and brooms. Truck-Lite is a global producer of safety lighting, forward lighting, wiring harnesses, mirrors, turn signal switches, safety accessories and telematics solutions to the heavy-duty truck, trailer and commercial vehicle industries. Fisher, Western and Snow Ex snow and ice control equipment. Ferris and Hustler commercial lawn mowers. Stihl power equipment. Valley Blades Limited designs, manufactures and distributes blades, cutting edges, ground engaging tools (G.E.T. ), wear parts and accessories for construction, mining and snowplow equipment. Its innovative products are sold around the world. Valley Blade will display the innovative PolarFLEX plow blade system, which is a segmented flexible plow blade designed to effectively clean the road and increase the overall efficiency of any snow removal operation. Vermeer Northeast has three locations, servicing the entire Northeast and is a full-service Vermeer equipment dealer that specializes in selling, leasing, training and servicing all brands of equipment for utility installation, tree care, landscape, organic recycling and wood waste processing equipment. The company provides replacement parts, accessories, and tooling and parts. Vermeer Northeast has a team of expert technicians who have received the latest training and are provided with the most advanced tools and an extensive inventory of parts. Technicians work on all makes and models and other services they provide include: knife sharpening for chippers, machine extended warranties, planned maintenance service programs, and custom fabricating and welding. The company offers onsite service through its fleet of service trucks and mobile technicians. Vermeer Northeast will be displaying vacuum excavators from VacTron that provide maximum productivity for potholing utilities, site cleanup and fluid management. White's Farm Supply Inc. is a full-service equipment dealer for Case-IH, New Holland, Krone, Kubota, Gehl, Ferris, Cub Cadet, Stihl and more for new and used tractors, forage harvesters, farm equipment, construction and lawn and garden equipment.